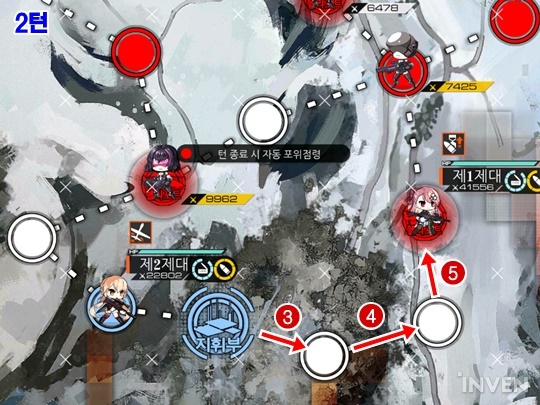 In order to open up Area 0 for the mission, you must clear 4-4E level. Unlike other Areas, there is only 4 missions, and no night or emergency missions. 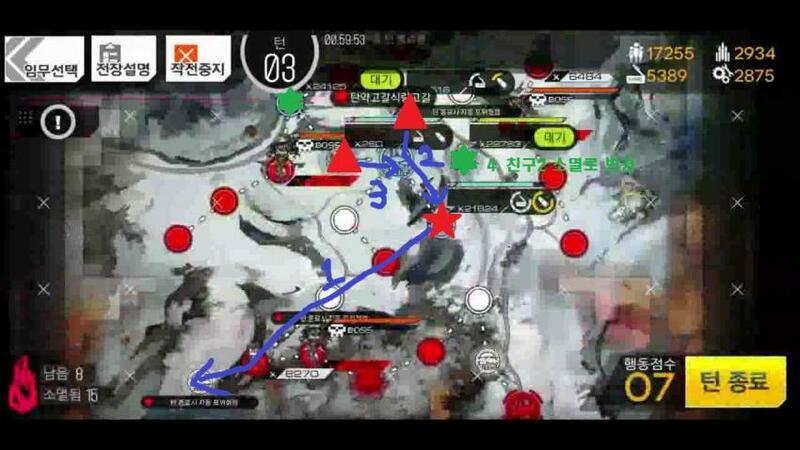 Area 0 is on top of area 1 but in terms of enemy unit strengths it is equivalent to area 6 strength at later missions. 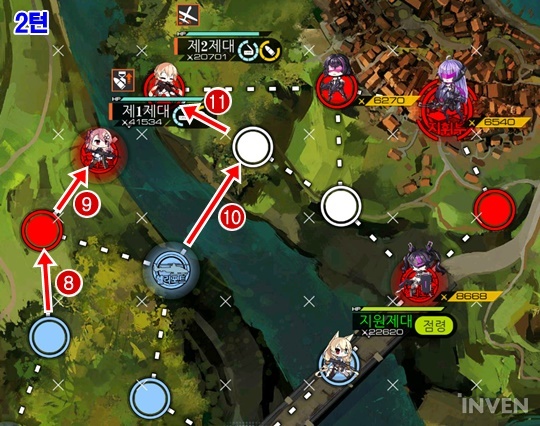 0-4 also introduces 3 boss units in the map with one at 5 million CP… It is best to go around the boss, Which will be covered below. S-Rank condition: Kill 3 unit in 3 turns; control enemy HQ. Map View. 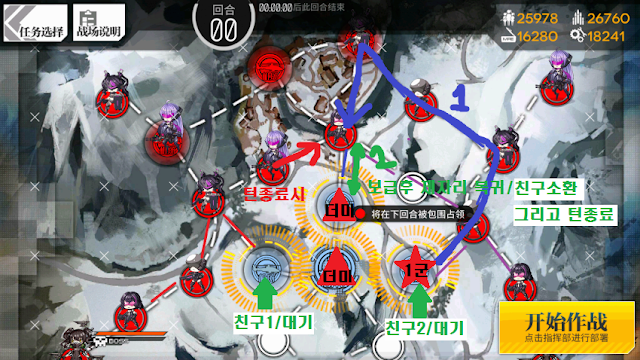 This map really does not require an explanation other than to follow path order. This method also allows for all medals to be earned in one go. 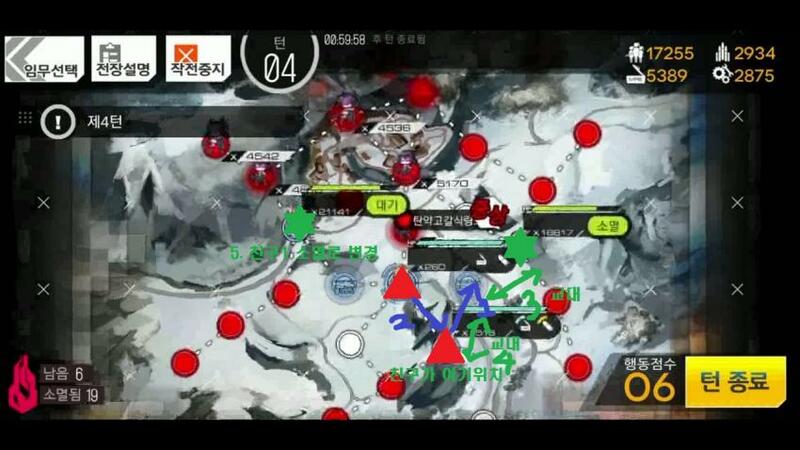 Start: Spawn Main Echelon on HQ, and 2nd Echelon on Helipad. Turn 1: Main Echelon moves up 2 to take Helipad on the center. 2nd Echelon moves down 1, spawn 1st Friend Echelon (set to HQ). Swap back to helipad and move up 1 with 2nd Echelon. Spawn 2nd Friend Echelon at HQ, also set to HQ. 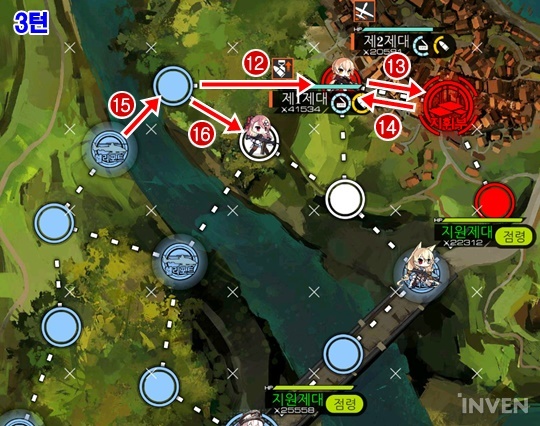 Turn 3: Following current direction above will also get silver medal on top of gold medal in one attempt. 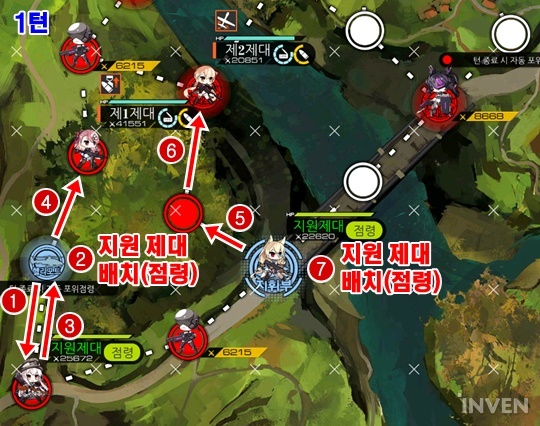 Move main Echelon to enemy HQ and back on node, Followed by 2nd Echelon to take neutral node. 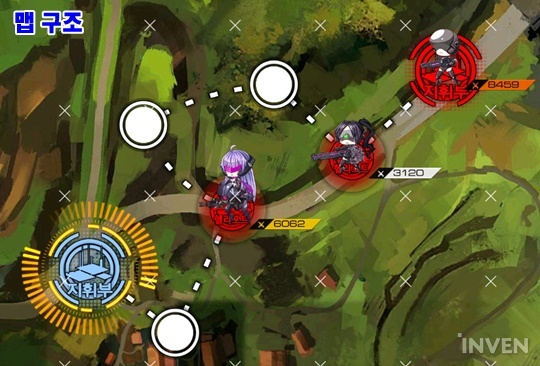 When Friend Echelon moves at end of the turn, it will surround take rest of the nodes in the map to friendly control. If you mess up, you have one more turn to fix it. Map View.This map is takes a bit of luck. If enemy unit moves in unlucky direction, it will lock you out of the Gold medal requirement, which is frustrating. Just be patient and follow directions on the map. You will get it soon enough. 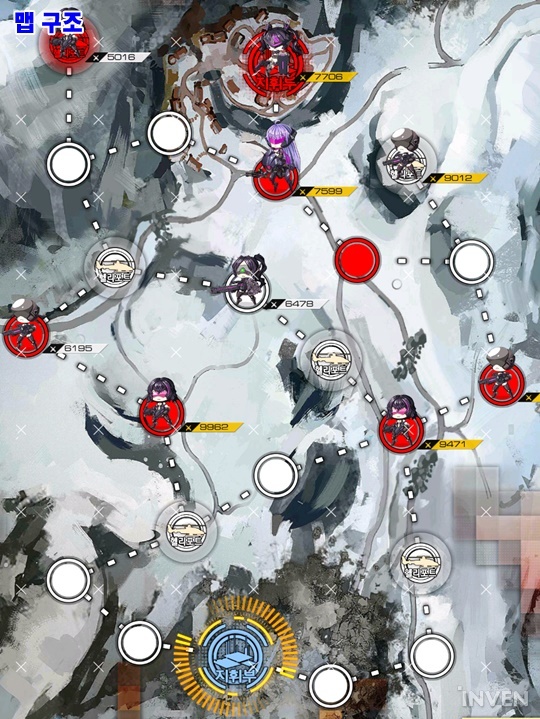 If you somehow find reliable way to S rank clear this mission 100% of the time, let me know and i will edit this post. Turn 1: 2nd Echelon moves 1 to left. Then spawn main Echelon to the HQ. Turn 3: 2nd Echelon moves to take enemy helipad on the bottom left. Spawn Dummy Echelon with remaining MP. Turn 4: This is where you find out if you can get S rank on this mission or not. There’s no extra MPs to spare, so with these 6 moves, you have to meet 6 kill requirement. By the time you take HQ and don’t have 6 kills, try again. 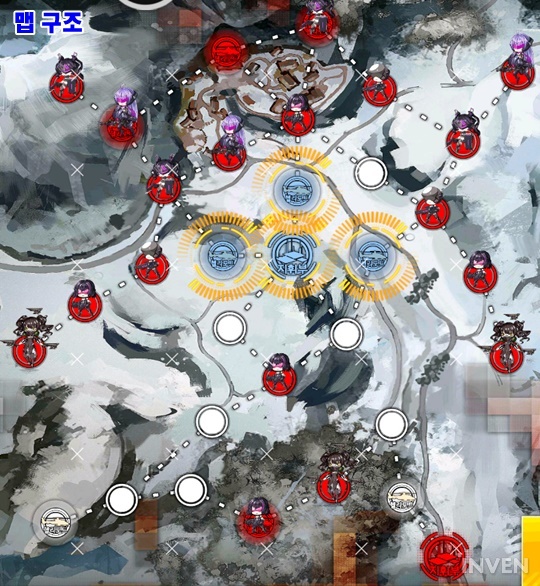 S-Rank condition: Kill 13 unit in 7 turns; control enemy HQ. So… this map is intimating at first. but it’s really not that bad once you realize you don’t have to fight bosses. Your Friend Echelons will. so make sure you got some beefy Friend Echelons before starting this. Use your strongest Echelon as this unit will be killing all 13 units. 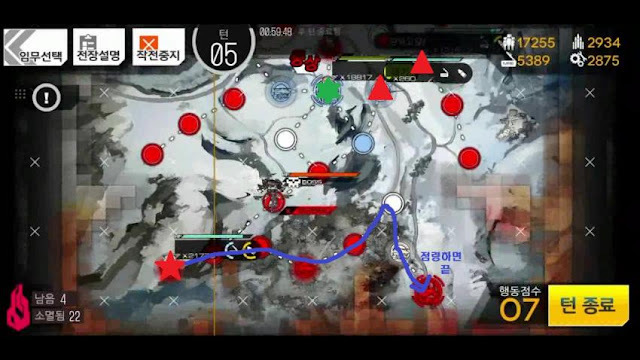 At this point, if you are considering S ranking 0-4, it will be safe to assume that you have least one Echelon with max link and max level with decently equipped as well. 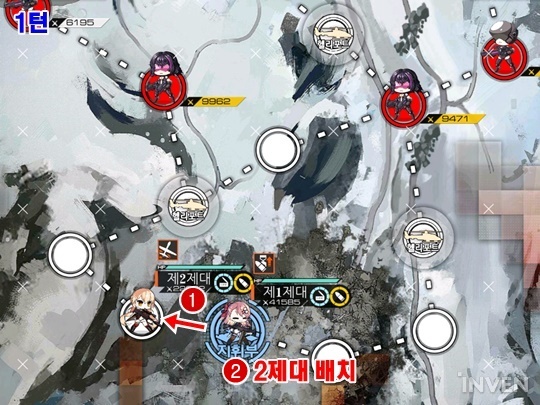 Start: Your Main Echelon spawns in helipad to right of the HQ (red star). 2 dummy Echelon on the HQ and upper helipad on top of HQ (red Triangles). 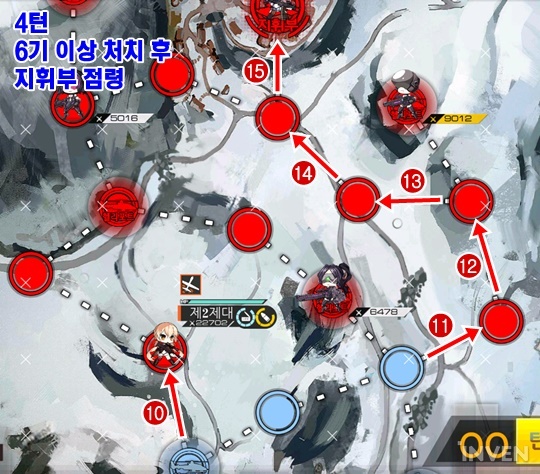 Turn 1: Main Echelon will follow along blue arrow’s path, taking out 5 enemy units. Once it reaches the node on top of the friendly helipad, swap with dummy unit and resupply. 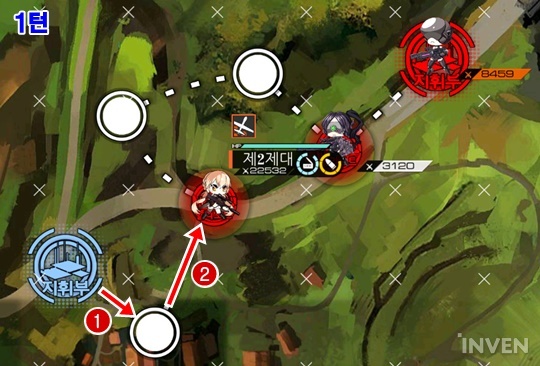 Swap it back and enemy unit will run into it during enemy movement phase. Spawn 2 Friend Echelon (2 highest with strongest on the right) on right and left helipad next to HQ. End turn. 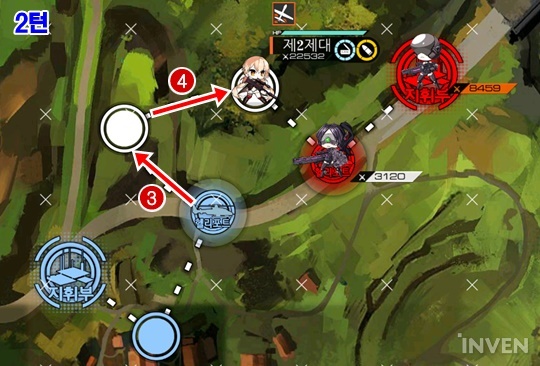 Turn 2: Before moving Main Echelon, Swap back with Dummy squad on top helipad to resupply. Follow the blue arrow path again. Path will pass by Friend Echelon on the left by one MP, then move back up to swap with Friend Echelon on the left. Resupply from center left helipad. Then swap with dummy echelon on HQ. 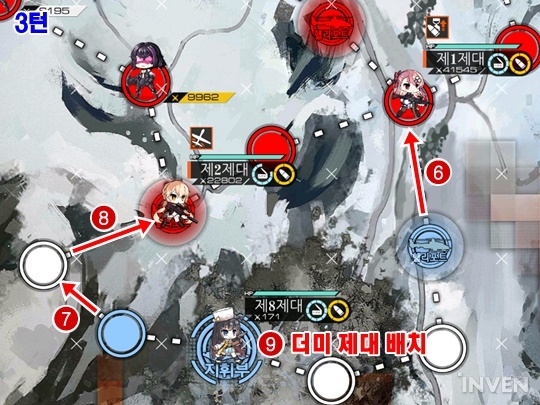 Next, you move main echelon to either left or right node on the bottom of your HQ with enemy on it. At this point you should have 12 kills. End Turn. Following along so far? Excellent. Turn 3: Main Echelon sprints to the bottom of the map, taking down final unit to meet 13 kill requirement. Then park Main Echelon by the helipad on the bottom left. This helipad will not get stepped on by 50k CP boss unit, it will just glare at you and move along towards your HQ. Back at the HQ, you will be evacuating Dummy Echelons away from the incoming enemy units. Dummy unit from the top helipad from HQ will move 2 down, one node under the friend echelon on the right. Set the setting of Friend Echelon on the right to “eliminate” [this is important]. Next, move your dummy on left of HQ to HQ node. Enemy unit is now on top of helipad just north of the HQ. 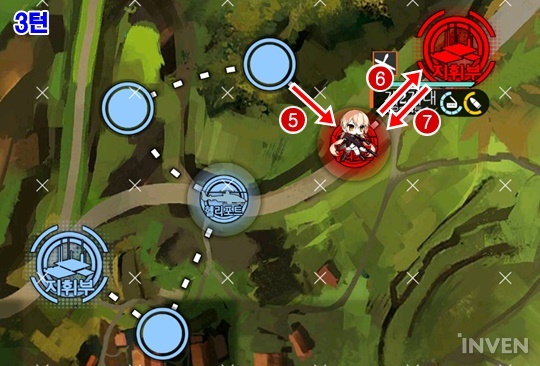 Your friend Echelons should have beaten 2 enemy boss units last turn. 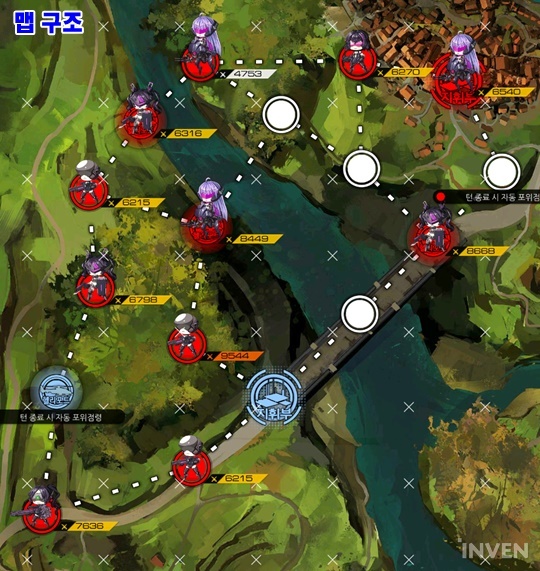 Turn 4: Dummy echelons are going to move up in conga line to the right helipad to swap back Friend Echelon to node on the bottom right of the HQ node. Reference picture above for move order [1~4]. Make sure Friend Echelon is still on “Eliminate” setting before ending turn or your HQ will be taken by the enemy unit and fail the mission. Also set Friend Echelon on the left setting to “Eliminate” so it takes over a helipad. If you done everything correctly, Friend Echelon will protect the HQ and take a helipad. 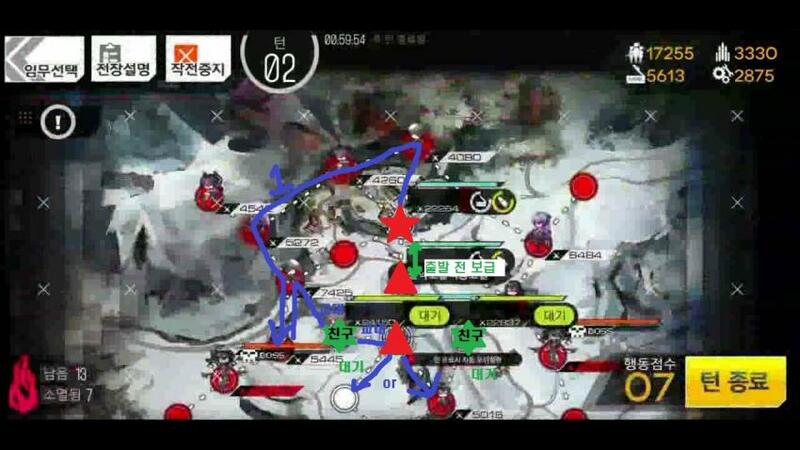 Turn 5: Run to enemy HQ with main Echelon. if you want to save bit of time, set both Friend Echelon settings to “wait”. End turn. Confused? Me too. So here is a video of it if you need a clarity. Page loads bit slowly.